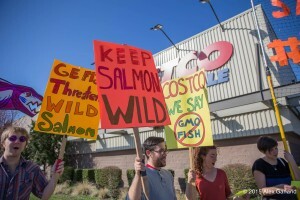 June 25th- Tell Costco to reject GMO Salmon! Outside of Costco Headquarters in Issaquah; RSVP for Details. At 10am on June 25th, a coalition led by Community Alliance for Global Justice will deliver over 100,000 petition signatures to Costco’s headquarters in Issaquah. We are urging Costco to say NO to genetically modified seafood, before the FDA says yes. On March 7th we attempted to deliver 50,000 petitions to the SODO Costco, but the store’s management refused to accept them! Click here to learn more about our March action, here to see all the pretty pictures of our colorful, vibrant rally, and here to watch a KiroTV segment covering the action. Help educate about the risks posed by genetically engineered salmon; We are happy to provide you with articles and/or flyers. Sign and distribute this petition demanding Costco endorse the Pledge for GE Free Seafood. Together we can keep modified seafood out of the marketplace! If you are able to attend the action on June 25th at 10am, please RSVP to fjp@seattleglobaljustice.org.